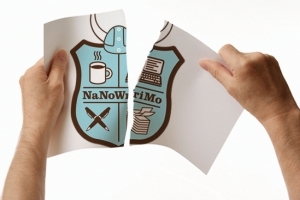 November is NaNoWriMo (National Novel Writing Month). For 30 days, thousands of people will be typing away at their computers. Their only aim: to finish a 50,000-word novel by the end of the month. It is not quality but quantity that counts, the organizers say. And that puzzles me. What is the purpose of encouraging people to write a bad book? To unblock creativity, I read somewhere. But I’m not convinced. “… there’s no shortage of good novels out there, there is a shortage of readers for these books,” Laura Miller reminds us in her article Why National Novel Writing Month is a waste of time and energy (http://www.salon.com/books/laura_miller/2010/11/02/nanowrimo/index.html). And I agree. We don’t need more writers. We need more readers. And bad writing is not going to encourage people to read. Besides, writers don’t need encouragement to make them write, more than fish need a coach to teach them how to swim. Fish swim and writers write. No matter what. We, writers, write because we have a compulsion–a gift or a curse I do not know– to do so. We write even if our daughter thinks it’s social suicide to read our book despite the fact that said book is a Young Adult novel and that her friends couldn’t put it down. We write even if our boy tells us, in a sentence peppered with expletives we choose to forget, he will never read our book. We write because we can. Because we must. Because our characters speak to us, urging us to tell their stories. And because we can’t forget the broken arch we once saw at low tide emerging from the mist. We write to remember how it felt to fall in love and to stop the pain of the betrayal. We write to fill the hollow emptiness of an empty crib. We write to connect to others, to share what we’ve learned by living, what we wish we knew when we were young. And even if we knew no one will ever read us, we would still write. Because we are writers, and writing is what writers do. Yet, I must confess a deadline is not such a bad thing, for it does force us to write when we’d rather be doing something else. So I decided to give myself a challenge to spur my creativity. Not the challenge of writing a novel in 30 days, but that of posting the first draft of my new novel weekly here in my blog.